The Combination Tamperproof notice board from Notice Board Company is ideal for many applications including the education sector. 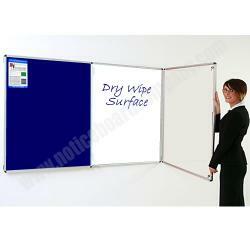 The Combination Tamperproof notice board is a brand new product from Notice Board Company. The board has an aluminium frame with easy fix corners. The doors are glazed with shatterproof 3mm PET glazing fire certified to BS476 Class 1Y and are complete with an allen key lock. The board backing is a 50/50 split. Half of the board is felt fabric which is fire retardant to BS5867 part 2 1980 and the other half is a dry wipe surface. The felt surface accepts velcro and pins. The Notice board is also supplied with a wall fixing kit. There is also a great range of colours for the felt backing insert. 09/08/2013 - New iPad Holders from NBC Products! 28/03/2012 - Follow Us On Twitter For Discounts Codes! 20/03/2012 - Our Metropolitan Boards Can Now Be Branded! 30/11/2011 - Church Notice Boards in time for Christmas! 27/10/2011 - Notice Board Company Introduce 3 New Colours To Their Tradition 30 Range! 12/10/2011 - Combination Notice Boards For Your Home! 06/10/2011 - Notice Board Company are now on Twitter! 03/11/2010 - Notice Board Company are offering 10% off everything! 11/10/2010 - Early Nights Are Drawing in So Brighten Up Your Display! 08/09/2010 - Notice Board Company Introduces The All New Sliding Door Showcases! 26/07/2010 - New Maitre'd boards perfect for hotels and lobbies. 06/07/2010 - 10% discount off our entire product range for education authorities. 22/06/2010 - Fantastic Month Long Sale of Tamperproof Notice Boards. 17/05/2010 - Brand new school prices are back from Notice Board Company! 06/05/2010 - Brand new school prices are back from Notice Board Company!